Getting my kids to agree to watch anything that isn’t found on a kid channel can be pretty difficult, even when it is something like the Super Bowl. When it comes to Sophie, make that ESPECIALLY the Super Bowl. However, they are my children which means that they can be bribed with two things: 1) party food, 2) games. This Sunday, we’re planning both. For the past two years we’ve played Super Bowl Bingo during the commercials. 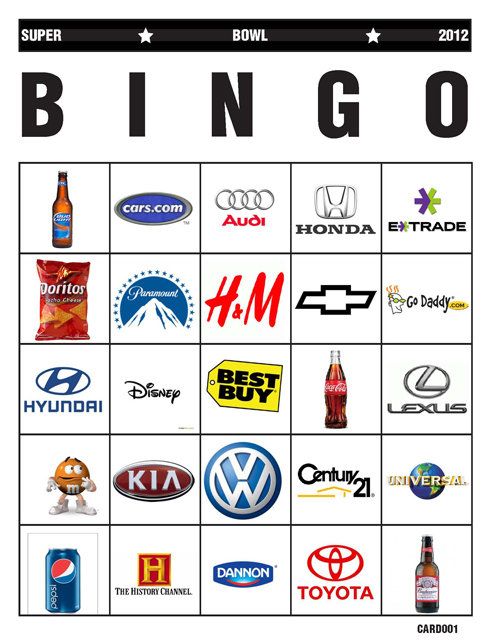 Each bingo card features the logos for companies that are advertising before and during the game. Since the board uses logos, it is an excellent game for non-readers, beginning readers, kids, and adults. Pretty much anyone who may join you for the game. The rules are up to you – we like to play regular straight-up bingo, help each other along, and award a prize. This year, the winner will receive $1.00 and the title of Super Bowl Bingo Champ. I think you’ll agree, the stakes are pretty high stakes.